CarePartners Adult Day Services, 68-A Sweeten Creek Rd. Meetings are the 1st Wednesday of each month, from 10:30-11:30am at CarePartners Adult Day Services located at 68-A Sweeten Creek Road in Asheville. For more information, please contact Kenya Miles at 828-277-3399. Open to adults who have experienced any form of brain injury, such as stroke, traumatic brain injury, Parkinson’s or ALS. Meetings are the 1st Wednesday of each month, at 3:30 pm, in the cafeteria. For more information, call 828-369-4171. 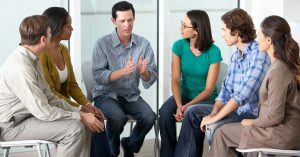 Join us for our Brain Injury Support Group on the 1st Wednesday of the month, from 3:30 pm - 4:30 pm. The group will meet at Angel Medical Center in the cafeteria.